Top trends at the Consumer Electronics Show held in Las Vegas in January 2014. One of the buzzwords at February’s Mobile World Congress in Barcelona. According to a 2015 Credit Suisse report, the market for wearable technology is currently worth between $3 billion and $5 billion, and it is expected to reach $70 billion by 2050. The wearables market exceeded $2 billion in 2015, and is expected to hit 4 billion in 2017. 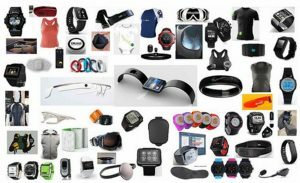 Just under 50 million wearable devices were shipped in 2015 and over 125 million units are expected to ship in 2019. Growth in the wearables market is expected to increase 35% by 2019. Companies are beginning to test wearables in basic use cases like workplace security access (23%), employee time management (20%), and real time employee communication (20%). Employees equipped with wearable technology reported a 8.5% increase in productivity and a 3.5% increase in job satisfaction. Companies are also beginning to embrace “bring your own wearable” (BYOW) models with 54% currently supporting a BYOW model and an additional 40% planning to support this model in the future. Over 50 billion internet-connected devices will exist worldwide by 2020. 51% of people surveyed cited privacy as their biggest concern with wearable tech. One in six consumers currently owns and uses wearable tech. An interconnected environment where all manners of objects have a digital presence and the ability to communicate with other objects and people. Wearable computers, smart health trackers, connected smoke detectors and light bulbs. Any Internet connected device that is not a mobile phone, tablet, or traditional computer. 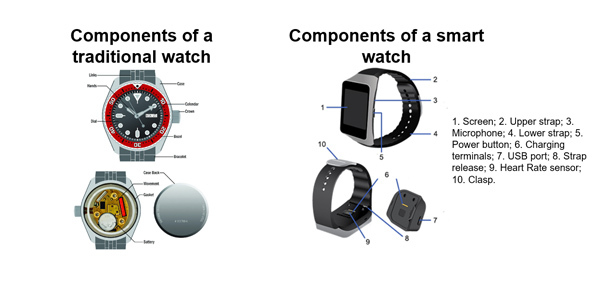 What are the benefits of wearables ? Health care: insulin and blood-pressure cuffs that connect to a mobile app; patients can give caregivers, relatives, and doctors access to their health data through apps; improved quality of life; disease prevention; tailored medications based upon constant data dialogue between patient and doctor. More efficient energy usage: smart meters can enable providers to analyze consumer energy usage. Home automation systems: single platform connecting all the devices within a home. What are the risks of wearables ? Collection of sensitive personal information, such as precise geolocation, financial account numbers, or health information. Collection of personal information, habits, locations and physical conditions over time. Volume of data: fewer than 10,000 households can generate 150 million discrete data points per day, approximately one data point every six seconds for each household. Sensitive data can provide beneficial services to consumers, but also increases the risk of unauthorized uses. Companies might use this data to make credit, insurance and employment decisions. Such use might be problematic without the consumers’ knowledge or consent. The FCRA applies to third party consumer reports used for credit or employment purposes; it requires consent for a report to be generated and allows that report to be viewed for inaccuracies. The Act imposes certain limits on the use of consumer data to make determinations about credit, insurance, employment or related purposes. Imposes obligations on covered agencies, such as employing reasonable procedures to ensure maximum possible accuracy and access to gathered data. Marketers want to know what you do at home, when you shut the door. IoT devices open the door to accessing this valuable information. 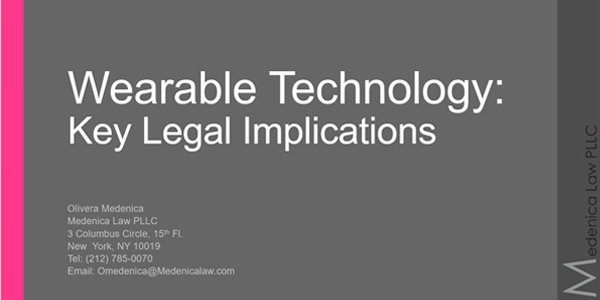 Wearables raise a number of significant legal issues with respect to data obtained from the user and third parties. Vast majority of wearables currently focus on sensitive health-related and even biometric data. 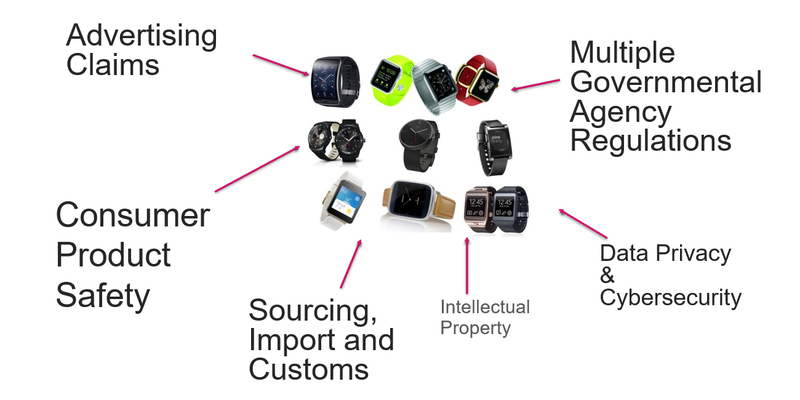 While the wearable captures and processes data collected from the user, the data is subsequently stored by the technology company. Adequate safeguards must be in place to protect this data. Safeguards must comply with the regulatory frameworks of both where the data is collected and where it is stored. Organization for Economic Cooperation and Development (“OECD”) privacy guidelines. European Union Directive on the protection of personal data. Health Insurance Portability and Accountability Act (“HIPAA”). Network Advertising Initiative Code of Conduct. Obama Administration’s Consumer Privacy Bill of Rights. FTC’s Report on Protecting Consumer Privacy in an Era of Rapid Change (2012). May 2014, White House released a Big Data report. President’s Council of Advisors on Science and Technology released a companion report. September 2014, Europe’s Article 29 Working Group issued an Opinion on Recent Developments on the Internet of Things. August 2014, oneM2M, a global standards body, released a proposed security standard for IoT devices. January 2017, Department of Commerce Internet Policy Task Force & Digital Economy Leadership Team issued an Internet of Things report entitled Fostering the Advancement of the Internet of Things. The Health Information Portability and Accountability Act protects the privacy of an individual’s health information. HIPAA’s protections are enforced through the Privacy Rule – or federal regulations promulgated by the U.S. Department of Health and Human Services. Prohibition on “covered entity” from disclosing or unlawfully using a person’s “individually identifiable health information” without specific written consent. Civil penalties range from $100 to $50,000 per violation. EU Data Protection Directive is expected to be replaced with the uniform General Data Protection Regulation (GDPR) in May of 2018. Expanded territorial reach: applies to data controllers and processors outside the EU whose processing activities relate to the offering of goods and services (even if for free) to, or monitoring the behavior (within the EU) of, EU data subjects. GDPR places onerous accountability obligations on data controllers to demonstrate compliance. GDPR establishes a tiered approach to penalties for breach which can result in fines for up to the higher of 4% of annual worldwide turnover or 20 million euros. Personnel practices must promote good security. Due diligence that service providers that can provide reasonable security. Does the data relate to the product’s direct purpose? Maintain it in de-identified form? Policies for not re-identifying the data. Notice and choice not necessary when collecting/using consumer data for practices that are consistent with context of transaction. Choice at point of sale. One of the recommendations is that Congress consider enacting broad-based privacy legislation. Without legislation, FTC cannot mandate certain basic privacy protections, absent a specific showing of deception or unfairness. Key issues: ownership, access and usage of data and software. Can the data by copyrighted? Customer lists, methods of production, marketing strategies, pricing information, and chemical formulae. Lesson from the dual use devices. Legitimate business purpose v. Employee resentment. E.g. : detecting fatigue in medical professionals; monitoring a production line for quality control purposes. 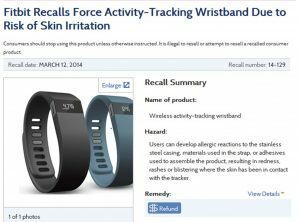 Companies should establish a policy addressing the business purpose of the data collected from employees wearing the wearable device. Limits should be placed on the gathering of personal and private information about employees. Actions implemented to secure this information. Company wide policies and training. Amends the regulations under Title I of the Americans with Disabilities Act and the regulations under Title II of the Genetic Information Nondiscrimination Act as they relate to employer wellness programs. “wellness program” refers to health promotion and diseases prevention programs and activities offered to employees. Title I of the ADA generally restricts employers from obtaining medical information from applicants and employees but allows employers to make inquiries about employee health programs which includes many wellness programs. Medical records developed in the course of providing wellness programs must be maintained in a confidential manner. 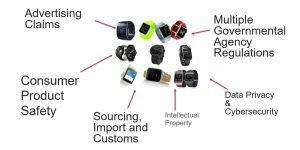 Issue: How is a smart watch classified under the tariff code regime? From an import perspective, will the tariff schedule catch up? Can track every part of the user’s day, including activity, exercise, food, weight and sleep. Virtual “black box” for the human body. Informal discovery may be a viable option where the user’s profile is public. If profile is private, then more formal discovery efforts are necessary. Ownership of data: user or social networking site? Time is of the essence: spoliation issues and litigation hold letters. 3 Columbus Circle, 15th Fl.